lists A1 and A2, and without quantitative restriction in List B. Special provisions designed to prevent re-export apply to the import of motor vehicles and petroleum products. * In addition it may decide on an upward change in the Israeli rates of customs, purchase tax, levies, excise and import charges on all goods not specified in Lists A1, A2 and B, and to quantities exceeding those agreed upon with regard to products in list A1 and A2. The above exceptions relating to imports from third parties (and there are other deviations relating to mutual trade) amount to deviations from a customs union concept and it is the scope that these provide for the Palestinians to set their own import regime with third parties that we are concerned with here. 4. The fact is that the Paris Protocol does not provide for a full, but rather a semi-customs union and it does not prevent the Palestinian areas from being legally identified as a separate customs territory. (2) In short it is unclear from its wording whether the Paris Protocol provides for a customs union or a free trade agreement. 6.Israeli-PLO differences have been brought to a head with the signing and implementation of the EC-PLO Interim Association Agreement. Israeli officials regard the agreement as a breach of Article IX of the Interim Agreement, which they argue does not permit the PA to enter into independent trade agreements. (2B) In February the Israeli Foreign Ministry’s deputy directorgeneral for economic affairs, Victor Harel, voiced his concern at the European Council of Ministers’ call for the full and rapid implementation of the EC-PLO agreement, which Israel argues also encourages the contravention of the Paris Protocol. 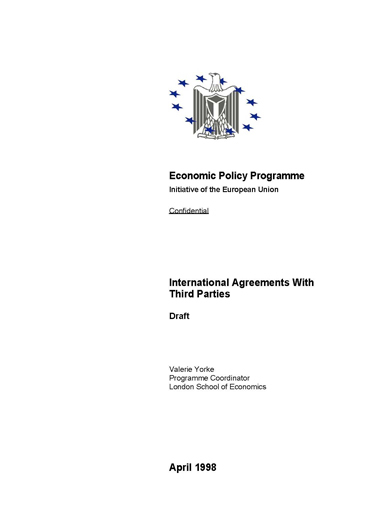 i)EC-PLO agreement is a de jure instrument that creates a separation between Palestinian and Israeli markets by treating the Palestinian areas as a separate trading entity with borders, thereby negating the Paris accords, which established the notion of a single Israeli-Palestinian territory” (3), or in current Israeli parlance “single customs envelope”. iii)The EC agreements with the PLO/PA and Israel create a problem with regard to the territorial definition of Israeli and Palestinian trading entities, says one Israeli interviewee, and Israel argues that it does not now know to what territory exactly the agreements apply. Israel does not accept the European interpretation of UN Security Council Resolution 242 with regard to territory and points out that the political border with regard to the West Bank is still to be established in final status talks. However, this interviewee maintained the position with regard to Gaza is clear. iv) As a consequence of ii) Israel argues that “industrial cooperation” between Israel and the Palestinian areas with regard to manufacturing aimed at the European market will be inhibited. The Israeli view is that the Palestinians have more to lose economically than Israel from this development. This, Israelis say, is because Israel’s exports to Europe that depend on de facto cumulation with the WBGS are marginal in relation to its total exports to the EU, while the Palestinians stand to lose thousands of potential job opportunities with the end of de facto cumulation – their goods will not qualify for duty free exemption in Europe without the benefit of cumulation. v) Israel regrets this development since it wants, it maintains, to develop job opportunities in the Palestinian areas in the interest of economic symbiosis, Palestinian economic development and the peace process. The textile industry in particular will be hard hit. Despite Israel’s good marketing and production skills, the industry is not competitive in global markets. If Israel loses its de facto cumulation link with the Palestinian areas where it currently benefits from cheap labour, Israeli producers will have to go to Pakistan or Turkey etc. vi) The PA will have to operate as an independent entity with its own border controls – difficult to achieve in current circumstances, says Israel. 8. Israeli interviewees also concede that there is an important political dimension to the above objections, namely that because the EC-PLO accord is a free trade agreement between entities with implied borders it works against the spirit of the Oslo accords: The Interim Agreement (Article 00) agreed that borders would be decided in final status talks and, consistent with this, the Paris Protocol creates a semi customs union with no borders between Israel and the Palestinian areas. Israel argues that in concluding a free trade agreement of this kind with the EC the Palestinians are not using the Oslo transitional period, as was intended, namely to build confidence through economic cooperation, but rather to acquire symbols of statehood. 9. However, the Palestinians consider that the Israelis also downplay the economic reasons for its opposition to the EC/PLO accord. The EU is Israel’s closest market and absorbs 60% of its agricultural exports. If the Palestinians were able to export their agricultural products directly to EU member states, these would compete with Israeli products.